Russian 15 year old becomes WGM! Alina Kashlinskaya becomes WGM at 15! 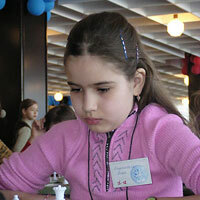 At the age of 15 , Alina Kashlinskaya became WGM after achieving her last norm at the Moscow Open. This is her second top record achievement in a row. In 2007 Kashlinskaya became Europe's youngest Women International Master, now in 2009 she is already Europe's youngest WGM. Among the U16 female players Alina Kashlinskaya is ranked now N2 in the world!